Not to be confused with Iichirō Hatoyama. In this Japanese name, the family name is Hatoyama. Ichirō Hatoyama (鳩山 一郎, Hatoyama Ichirō, 1 January 1883 – 7 March 1959) was a Japanese politician and  35th Prime Minister of Japan, serving terms from 10 December 1954 through 19 March 1955, from then to 22 November 1955, and from then through 23 December 1956. Ichirō Hatoyama was, as his name indicates, the first born boy. He was born into a wealthy cosmopolitan family in Tokyo. His father Kazuo Hatoyama (1856–1911) was a Yale graduate (and Speaker of the House of Representatives) and his mother Haruko Hatoyama (1863–1938) was a famous author and the founder of Kyoritsu Women's University. His brother Hideo Hatoyama was a noted jurist. Ichirō was a Master Mason and a Protestant Christian (Baptist). He was Japan's third postwar Christian Prime Minister. Iichirō Hatoyama, Ichirō's only son, made a career for himself as a civil servant in the Budget Bureau of the Finance Ministry. Iichirō retired after having achieved the rank of administrative Vice Minister. In his second career in politics, he rose to become Foreign Minister of Japan in 1976–1977. One of Ichirō's grandsons, Yukio Hatoyama, became prime minister in 2009 as a member of the Democratic Party of Japan. Ichirō Hatoyama passed away in his Hatoyama Hall house, in Tokyo's Bunkyō district, on March 7 1959. He was buried in the Yanaka Cemetery, in nearly Taitō district. Ichirō was elected to the House of Representatives as a Rikken Seiyūkai member in 1915. He was about to become prime minister in 1946, but was barred from politics for five years by Supreme Commander Allied Powers because they thought he had co-operated with the authoritarian government in the 1930s and 1940s. He was allowed to return in 1951. As prime minister in 1955, he rebuilt diplomatic ties with the Soviet Union, and favored parole for some of the Class A war criminals who had been sentenced to life imprisonment by the Tokyo Trial. CIA files that were declassified in 2005 and then publicized in January 2007 by the U.S. National Archives detail a plot by ultranationalists to assassinate prime minister Shigeru Yoshida and install a more hawkish government led by Ichirō Hatoyama in 1952. The plot was never carried out. Kaoru, Iichirō, Ichirō, and Yukio. Ichirō and some members of Hatoyama family are known as advocates of fraternity. During the purge against Ichirō (1946–1951), he received an English book The Totalitarian State against Man originally written in German by an Austrian freemason Richard von Coudenhove-Kalergi from a professor of Waseda University Kesazō Ichimura (1898–1950) who wanted Ichirō to translate the English book into Japanese. The English book struck a sympathetic chord in Ichirō, and he began to advocate fraternity, also known as yūai (友愛) in Japanese. On March 29, 1951, he was initiated as 1st degree of freemason, and on March 26, 1955, passed as 2nd degree mason, and raised as 3rd degree mason. Ichirō Hatoyama, Yukio Hatoyama, and Kunio Hatoyama. His grandsons are advocates of fraternity. However, when a Japanese press asked Yukio Hatoyama's office and the masonic grand lodge of Japan whether Yukio Hatoyama was a freemason, his office denied it and the grand lodge of Japan didn't answer it. At least, on his grandson Kunio Hatoyama, the brother of Yukio, on a Japanese TV program Takajin no Money on August 25, 2012, his partner Emily's Australian father was a member of freemasonry. He said so, and said he had swum in a masonic pool with her at Tokyo when he had started to going steady with her. Although he didn't say he himself was a mason or not, he insisted that he had not been invited to freemasonry, and he guessed his brother Yukio as a freemason. Yukio and Kunio became the officers of a fraternal organization named Yūai Kyōkai (or Yūai Association) with their sister Kazuko, founded by their grandfather Ichirō who became the first president of the former organization in 1953. 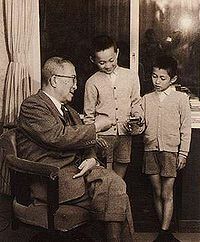 And also Ichirō's son Iichirō became the third president of the same former organization. The granddaughter and two grandsons of Ichiro's founded a fraternal school Hatoyama Yuai-Jyuku at Hatoyama Hall (Hatoyama kaikan) on April 2008. ^ "Hatoyama Ichiro (prime minister of Japan)". Britannica. 7 March 1959. Retrieved 29 August 2009. ^ "Land of the Reluctant Sparrows". TIME. 14 March 1955. Retrieved 29 August 2009. ; "Tokyo Storm Center; Ichiro Hatoyama Likes Hymn-Singing", The New York Times. 18 October 1956. ^ Odaka, Konosuke (2002). "The Evolution of Social Policy in Japan" (PDF). World Bank. Retrieved 13 January 2013. ^ "CIA Papers Reveal Japan Coup Plot". Military. Retrieved 29 August 2009. ^ Akama, Gō (1983). フリーメーソンの秘密 世界最大の結社の真実. Tokyo: San-ichi Publishing. p. 79. ^ Tim Wangelin. "Freemasonry and Modern Japanese History". Freemasonry in Japan. Far East Lodge No. 1. Retrieved 2 May 2013. On March 26, 1955, Ichiro Hatoyama and Yahachi Kawai, both Entered Apprentices (First Degree Masons), were made Fellowcrafts (Second Degeree Masons), and raised to Master Masons. ^ "New Master Mason". Toledo Blade. 26 March 1955. Retrieved 2 May 2013. TOKYO, March 26 (AP)—Prime Minister Ichiro Hatoyama became a master mason today. ^ Weeklypost (14 February 2012). "鳩山氏改名とフリーメイソンの関係噂は「事実無根」と事務所". Livedoor news. Retrieved 2 May 2013. ^ "たかじんNOマネー". 関西版TVトピック検索. tvtopic.goo.ne.jp. 25 August 2012. Archived from the original on 2 July 2013. Retrieved 2 May 2013. ^ "Yuai Association". Yuai Association. Archived from the original on 26 August 2014. Retrieved 2 May 2013. ^ "役員". Yuai Association. Archived from the original on 26 August 2014. Retrieved 2 May 2013. ^ "3代目会長 鳩山 威一郎". Yuai Association. Archived from the original on 30 October 2013. Retrieved 2 May 2013. Wikimedia Commons has media related to Ichirō Hatoyama. This page was last edited on 13 February 2019, at 23:21 (UTC).